I have only just heard that one of my favourite poets, Roy Fisher, died last month. There were obits in the Graun and the Telegraph (of which more in a bit), but – evidently – I missed them. Anyway, as well as being a poet, Roy was an accomplished jazz pianist who’d accompanied Bud Freeman, Wild Bill Davison and the soul singer Ruby Turner. One of his finest poems was a tribute to the great, but latterly neglected, Chicagoan pianist Joe Sullivan. Why do people who go to great pains to avoid showing their ignorance of painting, literature or classical music blithely drop dreadful clangers when mentioning anything to do with jazz? The Daily Telegraph recently carried an obituary of the poet Roy Fisher, who, as you may know, was also a semi-pro jazz pianist in the Midlands. (He was proud of having once been the “token white” in Andy Hamilton’s Caribbean Combo.) Anyway, one of his poems is The Thing About Joe Sullivan, and the obituary goes into some detail about it. Unfortunately, the writer (Telegraph obits are anonymous) makes the elementary mistake of referring to “the imaginary pianist Sullivan”. Now, you don’t expect literary folk to know much, if anything, about jazz, but you do expect them to do a bit of basic checking. It would have taken less than a minute to Google Joe Sullivan and ascertain whether he was a real person or a figment of Roy Fisher’s poetic imagination. And it’s by no means the first time this sort of thing has happened. A particularly choice instance occurred in 2000, when the American play Side Man, by Warren Leight, was staged at the Apollo Theatre, London. It’s about a trumpet player who, according to the review I read in (I think) The Spectator, idolises an “imaginary figure”, called (wait for it) Clifford Brown! United Left Scotland is relieved that our candidate Len McCluskey has won the General Secretary election and secured a third term. But welcoming the win by Len must also include facing up to some harsh truths. A very low turnout of 12% is a major worry and we can only assume that turnout for the Executive Council candidates may be even less, especially given that none of them are household names or have had much mainstream media attention. We also need a realistic analysis of what can only be described as the collapse of the left vote. The last time Len stood he got 144,000 votes and the time before that he attracted 102,000 votes – and that was when he stood in the much more crowded list of five candidates and was standing for first time, not as the incumbent. How come over 1,185 nominations with representation of over 560,000 members only resulted in 59,000 votes for Len – barely 10% of the membership of the branches which nominated him? Nearly all Executive Council members, the chairs of 90% of national committees, and all but one Regional Secretaries endorsed Len for General Secretary. So how come we were able to inspire only 5% of the union’s membership to cast their vote for Len? Questions should also be asked about the wisdom of Len choosing to resign and trigger the election, particularly without seeking advice and endorsement from any of the United Left constitutional committees or a United Left all-member meeting. In Scotland, Len’s decision to launch his whole campaign at the breakaway group PULS meeting in January was questioned at the time and remains an issue of concern for United Left members in Scotland and elsewhere- especially given the dominant role of full timers supporting PULS. Was Len the right candidate, given his age and his original commitment to stand as a one-term-only General Secretary when he was first elected by the merged membership of Unite? Members from MSF, AEEU and Amicus had all experienced General Secretaries clinging to power long after the rule book and the will of the membership allowed: Roger Lyons, Ken Jackson and, most disappointingly of all, the erstwhile left General Secretary Derek Simpson. Underestimating this reaction to Len seeking a third term was maybe a significant factor? We must, however, also ask ourselves as United Left activists: Are we out of touch with our members as well? If nominations at branch and workplace meetings do not result in the members voting for the candidate whom we, as activists in those meetings, have proposed, then we need to shoulder some of the responsibility for this. Within United Left meetings there has been the view expressed that we have had an excessive focus on elections and people securing or continuing in their positions rather than on the politics and policies that we want to see progressed. There is nothing wrong with our attention on winning elections, but the win needs to be for the purpose of advancing policies and actions that support working people and their families. The problem is when electioneering for one individual over another in itself is seen as politics. Instead, we should be engaging with members in workplaces and communities as part of the approach to building a politicised and motivated membership who are then enthused and inspired to take part in the union and all its democratic processes, not just in the postal vote for occasional choices of Executive Council or General Secretary candidates. If we are to achieve our aims as United Left, then our priority must be: rebuilding grassroots connections; re-establishing lay membership control at all levels of the union; and reversing the trend of a fall in membership, a fall in turnout in elections, and a fall in the numbers of people voting for left candidates. We should not forget how close we came to disaster in this election. Gerard Coyne, the candidate backed by the right wing media and the most right wing elements within the Labour Party, came within 5,500 votes of victory. The closeness of the result will have given the forces of conservatism within our union a new confidence, thereby endangering any future progressive agenda for the largest trade union in the UK. So while, yes, it’s a time to celebrate the victory of our United Left candidate as General Secretary, we must not be at all complacent. This election and the early analysis of the vote tells us there is much work to be done. Should the left back Macron to stop her? The first round of the French presidential election, on 23 April, confirmed that “Trump effects” are spreading. The 2008 economic crash and the economic depression since then have discredited mainstream neoliberal politics, and so far right-wing nationalist, “identity politics”, demagogues have seized most of the gains. The revolutionary socialist candidates, Philippe Poutou and Nathalie Arthaud, with 1.21% and 0.65%, did a bit better than in 2012, but still worse than in 2007 (4.08% and 1.33%). Soft-left candidate Jean-Luc Mélenchon got 19.43%. The great gainer, however, was the Front National’s Marine Le Pen, with 21.43%, up on 17.9% in 2012 and 10.44% for the FN candidate in 2007. Le Pen won only 5% of the vote in Paris; 7% in Rennes, Nantes, Bordeaux; 9% in Lyon; 13% in the whole Ile-de-France region including Paris; but 24% in Marseille, 25% in Nice, and more in small towns and villages. Just ahead of Le Pen, and favoured to win the second-round run-off on 7 May, was Emmanuel Macron, a former minister in the current government (led by the Socialist Party) who split off to form his own “centre” neo-liberal movement, with 23.86%. The “mainstream” left, the Socialist Party, had its chance in 2012, when it won elections by a clear majority – with some leftish policies which it then trashed in favour of harsher neoliberalism. The task now is to regroup the real left, and equip it to win a majority. Not an easy task, but an urgent one. The lesson is that if the left dawdles and equivocates, in economic turmoil like today’s, then the right does not stand still. The FN does not have the power to mobilise on the streets of a full-scale fascist movement. But Marine Le Pen herself is a fascist, surrounded by a cadre of fascists. France’s constitution gives the president great powers. Even if Macron wins on 7 May, he promises worse than Hollande rather than better. Unless the left rebuilds as an independent force in time, the next presidential election will be even more scary. Groups on the French left have commented on the first-round presidential results, the second round coming on 7 May, and the parliamentary elections following on 11 and 18 June. The Socialist Party and the Communist Party – and mainstream right candidate François Fillon – will vote on 7 May for Macron to stop Le Pen. Although his main base was the CP and other groups taking a similar attitude, Jean-Luc Mélenchon says he will consult his supporters about what to say about the second round. Ensemble calls for mobilisation on the street on 1 May, and in voting against Le Pen on 7 May, to stop the far right gaining power. At the same time, we will fight Emmanuel Macron’s project, Once Le Pen is eliminated, we must stop Macron constituting a majority in the National Assembly with the right wing of the Socialist Party and a section of the mainstream right around his ultra-neoliberal program, which will continue the policies of Hollande’s five years in worse form. Let’s pull together a left which stands up for itself. On Sunday 7 May, many people will want to block the FN by voting for Macron. We understand the desire to push back the mortal danger for all social progress and rights, especially for immigrants and those of immigrant origin, which the coming to power of Marine Le Pen would represent. But we insist that it is the policies of cuts and repression, especially when carried through by the supposed left in government, which are the cause of the rise of the FN and its disgusting ideas. Macron is not a barrier against the FN, and to push back that danger durably, there is no other answer than going back on the streets, against the far right, but also against all those who, like Macron, have introduced or want to introduce anti-social measures. Some of my voters will cast a blank vote like me. Others will spoil their ballot papers. Yet others will abstain. Some, maybe, will choose to vote for Macron, believing, wrongly, that by doing that they oppose the rise of the FN. The main thing is to be aware that, whatever the result of the vote, the exploited, the retired, and unemployed, will have an enemy in the presidential palace. Neither Le Pen nor Macron: this orientation [on the second round] does not play into the hands of Le Pen as both the partisans of “national unity” and comrades who see an immediate fascist danger are going to say, sincerely or not, because the orientation has immediate points of concretisation. Marine Le Pen’s Front National does not have the mobilising power to install a fascist regime if she wins the presidency on 7 May. But Le Pen’s politics, and the FN top cadre around her, are fascist. The presidency will give them huge power to impose discrimination, heavy police powers, union-bashing policies, and re-raised frontiers between nations which will ricochet across Europe. The mainstream neoliberals pave the way for Le Pen. The whole of the French left will mobilise on the streets on 1 May, and, one way or another, will seek to secure left-wing representation in the new National Assembly elected on 11-18 June to limit whichever president wins on 7 May. On 7 May itself, in my view, workers can best serve the continuing struggle by using the only option available on the ballot paper to block Le Pen: vote Macron. Macron is bad, and the neoliberal policies of a Macron presidency not curbed by strong left-wing remobilisation will bring an even greater fascist danger in a few years’ time. Le Pen is worse, and Le Pen as president on 8 May is worse than a danger of Le Pen as president in some years’ time. It is a principle for us in elections to seek the maximum independent working-class intervention. On 7 May we cannot stand or support candidates of the labour movement. Sometimes we shrug because the differences between bourgeois candidates are small and speculative. Sometimes we say that the “lesser-evil” bourgeois candidate is bound to win anyway, and in any case we are strong enough to make blank votes a real gesture of working-class independence. The outcome is not certain. The revolutionary left is not strong enough to raise blank votes visibly above the random level. It would be nihilistic disregard for bourgeois democracy and bourgeois cosmopolitanism to deny the big difference between Macron’s routine neoliberalism and Le Pen’s fascistic chauvinism. There is no Marxist principle against voting for a lesser-evil bourgeois candidate when it is impossible to have a labour-movement candidate. When the German Social Democracy was a Marxist party, before World War One, it routinely advised a vote for liberals against loyalists of Germany’s bureaucratic monarchy in run-offs when the socialists themselves had been eliminated. Left-wingers like Rosa Luxemburg and Franz Mehring did not dissent. We tell workers: Le Pen is worse than Macron. And do we then say: you must not vote Macron, however much you indict him and organise against him? Once you vote, you will forget your indictments? Those workers could reply to us: if you are so unconfident of your own political firmness that you dare not make an unusual step for fear of falling over, so be it. But do not attribute your own weakness to us, or make us pay the price of a Le Pen presidency for that weakness of yours. A vote for Macron is not just, or even mostly, a vote for more open borders, a defence of Muslims and immigrants, and an expression of opposition towards protectionism and racism. Macron is a former banker who wants to cut corporation tax to 25%, wants more flexible labour laws in the mold of the El Khomri Law, allowing companies to negotiate individual agreements with staff. His program is to reduce public spending by €60bn, cut 120,000 public sector jobs, and introduce greater “flexibility” in retirement age and the working week. It is a continuation of the “liberalization” demanded by the French ruling-class which Francois Hollande’s Parti Socialiste was unable to deliver. Hence, the flocking of Hollande-Valls wing of the PS behind Macron, together with centrist François Bayrou and sections of the French centre-right. Macron’s candidacy is a united front of the French establishment. Its neoliberal “reform” program will hit workers. A “critical” vote for this neoliberal programme will be indistinguishable from those who genuinely endorse Macron’s policy; both will be taken as legitimation for further attacks on our class, and will serve to undermine the credibility of the revolutionary left as it rallies a fightback. A vote for Macron could drive workers further in to the arms of the “anti-establishment” Front Nationale, who will continue to prey on the fears and insecurities of those suffering under capitalism. And it risks sowing illusions in the neoliberal center and its capacity to rescue us from a resurgent populist right. Lots of people who will vote Macron, people the revolutionary left needs to reach, will vote Macron not on the basis that he is a crook, but with enthusiasm and illusions. It is only the labour movement which can combine a defence of the gains of the neoliberal period – cultural cosmopolitanism, freer movement, economic integration – with a fight against the poverty, alienation and social distress it inevitably creates. As against Le Pen, Macron is a “lesser evil” but it is incumbent on Marxists to resolutely assert working-class independence and hostility to both. Even on the points on which we agree with Macron, our “Yes” is not his “Yes”. We say “Yes” to open borders, anti-racism and greater European integration but a resounding “No” to the capitalist nature of his programme, and even his capacity to defend those points on which we overlap. Probably the best coverage you’re going to get is from my pal Coatesy, who knows his stuff when it comes to France and has one big advantage over me: he is fluent in the lingo. Unite to Beat Le Pen in Ballot say French Communists. Nos rêves d’avenir sont désormais inséparables de nos frayeurs. Our dreams of the future are henceforth inseparable from our fears. Histoire et Utopie Emil Cioran. The French Presidential elections were earth-shaking, “In just one year, we have changed the face of French politics,” said a triumphant Macron, whose centrist pitch and so-called “progressive alliance” precipitated the country’s great political shake-up. Equally jubilant, his rival Le Pen said it was “time to liberate the people of France from the arrogant elites that seek to dictate their conduct”. Reports France 24. Macron came first with 23.75% of the vote. Le Pen second, with 21,53%. Fillon third with 19,91% and Mélenchon fourth at 19.64%. The Socialist Candidate, Hamon, at 6,35%, a score only slightly higher than their historic low (when they were called the SFIO), Gaston Defferre 1969 5,01 % represented a party which is now starting disaster in the face (Après la déroute de Hamon, le PS au bord du gouffre). The last time the Front National reached the run off for the Presidential election was in 2002, when Chirac faced Marine Le Pen’s Father Jean-Marie. Much of the left was swept up in a country-wide mobilisation to the far-right from winning power. This time both Fillon and Hamon have called for a Macron vote in the Second Round. Mélenchon’s supporters, who had hoped for a duel between their candidate and Marine Le Pen, vented their spleen at the “« Médiacrates » and « oligarques ». There are voices within la France insoumise calling for a blank vote. It has become common on the British left, and more widely in the English speaking world, to draw inspiration from Mélenchon and La France insoumise. There is little doubt that the movement’s candidate is capable of inspirational, lyrical and rigorously argued speaking. The US publication, Jacobin, has finally published an article which expresses doubts – familiar to readers of this Blog over the last couple of years – about La France insoumise. The Meaning of France Insoumise by Grégory Bekhtari. Bekhtari is a member of Ensemble, a major component of what was the Front de gauche. Ensemble’s majority backed Mélenchon by 72%, but did not accept dissolution into the ‘movement’ La France insoumise (Ensemble ! soutient Jean-Luc Mélenchon sans intégrer La France insoumise. November 2016. ). This alliance of left socialist, Trotskyist, green left and self-management currents has published both supportive and – minority – critical views on the candidate and the structure of this rally. Jean-Luc Mélenchon explicitly draws inspiration from the theories of Ernesto Laclau and Chantal Mouffe – an official supporter of his – adopting the formulas already used by Podemos, defining the ‘people’ against the ‘caste’ or the ‘oligarchy’. His adoption of this approach is clearly expounded in books such as L’ère du peuple [The Era of the People] or Le Choix de l’insoumission [The Choice to Rebel]. Mélenchon no longer uses the term ‘left-wing’, which in his view has been corrupted by the PS’s record in power and unattractive to the wider public. This discourse is also apparent in the position he has taken as a politician who directly addresses the population without the intermediary of a political party and its decision-making structures – not even the party of which he is still a member, the Left Party (PG). He has instead privileged the creation of France Insoumise, a new movement without elected structures whose base unit is the local ‘support group’ backing his candidacy. Jean-Luc Mélenchon’s candidacy struggled to unite forces to the Left of the Socialist Party. His Left Front partners did not appreciate seeing him proclaim himself a candidate, or indeed the mechanics of his campaign, which only afforded a consultative role to the parties committing to his cause – thus preventing their leaderships from being able to shape his program and the line he put forward. As well as this anti-pluralist modus operandi, some of his politically problematic media sorties were also a turn-off for PCF and Ensemble! militants, for instance when he spoke of detached workers ‘stealing the bread’ of the French; with regard to migrants, when the first idea he expounded was that he had ‘never been for freedom of movement’; with regard to the war in Syria, seeing Bashar al-Assad as a lesser evil faced with Da’esh; or in terms of his refusal to recognise the existence of a Russia imperialism, itself at work in this conflict. Despite his repeated defensive claims – which have consisted of responding that his arguments and his positions were being mischaracterized in order to damage him – we cannot totally dismiss the argument that Jean-Luc Mélenchon has sought to deploy buzzwords able to attract the attention of disoriented voters tempted either to abstain or else to vote for the Front National. He came out of the debate as the most effective left-wing vote among all the ‘big candidates’. Even beyond the Left, he exercises a certain force of attraction among former right-wing voters seduced by his integrity and his calls for a clean break, which are interpreted as a promise to put an end to a system that today profits only the ‘political class’ and the ‘oligarchy’. Thus just days before the election he finds himself in third place in the polls, tied with Fillon. The possibility of Mélenchon reaching the second round – and even winning a run-off against Le Pen – is thus coming into view, against all expectations. The strategy of social transformation via a revolution at the ballot box leaves a lot of room for doubt. We can expect a violent reaction by the bourgeoisie to protect its power and privileges. But in the current context, the hope of the step forward that could come from France Insoumise taking power, and the possibility that a period of radicalisation would follow, appear better able to mobilize the masses than any abstract warning of the future betrayals that may come from Jean-Luc Mélenchon once he is elected president. One might still ask if fourth position is still a strong one – though not much of a hope for those who would wish Corbyn to follow this path. But at present it’s the issue of voting in the second round that dominates the left. Today the French Communist Daily L’Humanité calls for a united struggle against Marine Le Pen. The ballot box is the central means to stop her. To block the road to the Presidency of the Republic of Marine Le Pen, to her clan, and to the threat that the Front National represents for democracy, for the Republic and for peace, is to use the ballot, unfortunately the only way to do so. Le Parti communiste appelle à battre Le Pen. The Socialists have just endorsed the same position, putting centreplace the need to beat the far-right, (à battre l’extrême droite). The FN remains a party of the extreme-right and not just for France, but for the European left and labour movement, it is important that the PCF’s call is heeded. This does not mean that the problems their vote and deep political roots in France pose is solved by such a vote. Mélenchon is fond of citing Victor Hugo. On wonders if Hugo would have backed abstention had it been possible to vote as freely as one can in the present French election to stop Louis–Napoléon. Then we have the legislative elections….June…. this is his hysterical nationalist (“mon beau pays, ma belle partire”) declaration, including a lot of clapping when he refuses to call for a united anti Le Pen vote. “Bien sûr, d’ici là, médiacrates et oligarques jubilent. Rien n’est si beau pour eux qu’un second tour entre deux candidats qui approuvent et veulent prolonger, les deux, les institutions actuelles, qui n’expriment aucune prise de conscience écologique ni sur le péril qui pèse sur la civilisation humaine, et qui les deux comptent s’en prendre une fois de plus aux acquis sociaux les plus élémentaires du pays. I spent a suspenseful Friday afternoon stalking my Unite friends attempting to find out the results, while they tried to imagine what the union would look like under a Coyne leadership – of course everyone understood what it would mean for the Labour Party. However by late afternoon it was clear McCluskey had won by some 6,000 votes on a 12% turnout. I had previously commented that a Coyne victory would demand a high turnout – i.e. he would have to mobilise those who don’t usually vote, as for sure the activists would turn out for McCluskey; this proved wrong, the turnout dropped and still Coyne nearly won! My initial thought is that the lower poll numbers come from two sources: first Unite changed its rules excluding a certain category of retired members, who traditionally voted in high numbers, second some 85,000 deserted McCluskey. It is possible these voters deserted McCluskey rather than the idea of a left union. They may well have thought he should not have stood for a third term, unable to vote for Coyne (and why in God’s name would they vote Allinson?) so they abstained. Coyne’s vote would seem to reflect a failure to garner members who don’t usually vote – rather he rallied the craft vote to his banner, just as the left winger Hicks had done in previous elections. Whether this speculation is right or not in big picture terms it is secondary to the real issue which is the turnout Anne posted and the voting numbers for Unite’s previous elections but even this does not give the full measure of decline, if you go back to the T&G when 30% plus voted. Of course Unite’s 12% turnout is a towering victory for democracy when compared with the GMB’s last General Secretary election. For both McCluskey and the union’s left wing organisation the United Left (UL) the question which should be uppermost in their minds is how was this result possible when the left has run the union since its formation, and when there has been no serious internal opposition to the left’s policies? How do they account for this yawning gap between the activists and the members -and more importantly how can they overcome it? The UL, looking at it from the outside, it is a hugely successful electoral machine comprising officers and members, and since Unite’s formation the majority of lay Executive members and both General Secretaries, Woodley and McCluskey, who identified as UL supporters. It is however unlikely the UL will be able to face up to this question, based on two assumptions: firstly when it comes to big issues the UL takes its direction from the GS and in reality is his creature; second and of far greater importance, is the dominance of conservative elements within its ranks. The first such group are UL members who sit on committees – the ‘committee jockeys’. It is through the mechanism of the UL that lay members can progress onto the committee structures. (For those who are unaware of ‘how these things work’ all unions have a means by which members progress into the structures. In the GMB for example it is achieved via officer led cliques). While UL supporters populate large swathes of the committee structures my guess is if one was to inspect the ‘left’ credentials of many of these UL supporters you would find they are bogus. I am not saying all UL representatives should be harden bolshevikii but the root by which many enter the committee structure is not through workplace activism but because they adopted left credentials as their passport to get onto committees. While I have no idea of their proportions within the UL, for sure such people have no interest in change – as long as their positions are not threatened. Undelying all this is a complete misunderstanding of the state of the union, class and class consciousness – a misunderstanding which is becoming increasingly delusional. Ranged against these two blocks are those who recognise the divide between activists and members and desperately want to change matters. My guess is they feel pinned down by the weight of the careerists and routinists and so do not have the space to explore how to tackle this burning question. The only force that can come to their’s and the union’s rescue is the General Secretary sponsoring change from above. When I mention this to my Unite friends there was a deadly silence. Andrew Coates draws attention to the supposedly “left wing” commentator Diana Johnstone’s defence of Le Pen – a warning to all those on the idiot-left (eg the UK SWP, Socialist Party and CPB/Morning Star), who think there’s something potentially progressive about an anti-EU, pro-sovereignty stance. “After the 2003 publication of her Fools’ Crusade: Yugoslavia, Nato, and Western Delusions, Johnstone became the centre of controversy over her claim in the book that there is “no evidence whatsoever” that the Srebrenica massacre of the Bosniaks was genocidal. The historian Marko Attila Hoare called it “an extremely poor book, one that is little more than a polemic in defence of the Serb-nationalist record during the wars of the 1990s—and an ill-informed one at that”. “The book was rejected by publishers in Sweden, prompting an open letter in 2003 defending Johnstone’s book—and her right to publish—that was signed by, among others, Noam Chomsky, Arundhati Roy, Tariq Ali and John Pilger. The signatories stated, “We regard Diana Johnstone’s Fools’ Crusade as an outstanding work, dissenting from the mainstream view but doing so by an appeal to fact and reason, in a great tradition.” Ed Vulliamy, who reported for The Guardian during the Bosnian War, called Johnstone’s book “poison” in response to the letter from Chomsky and the others. In her own defence, Johnstone has said her critics “reduce [her] book, as they reduce the Balkan conflict itself, to a certain number of notorious atrocities, and stigmatise whatever deviates from their own dualistic interpretation”. Johnstone: Cannot “reduce” Marine Le Pen’s anti-Immigrant stand to “racism”. 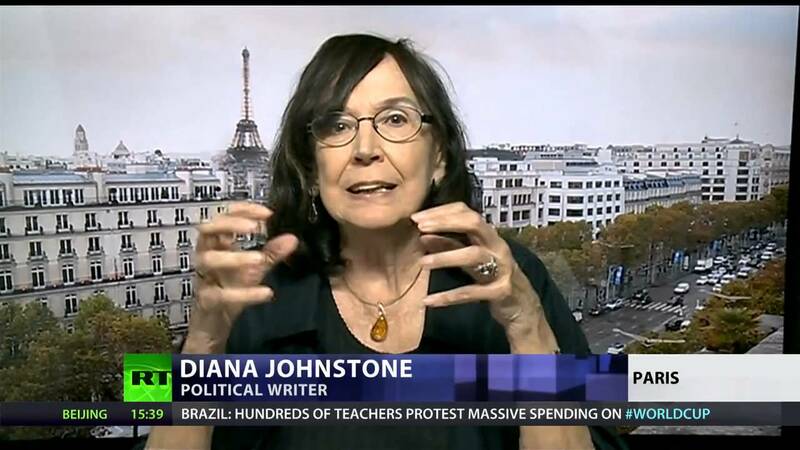 Diana Johnstone is a columnist for the American left site, Counterpunch. In her most recent contribution (21st of April) to the favourite journal of ‘wise-guys’ who want the ‘low down’ on politics, this is her view on tomorrow’s French Presidential election. Sovereignty” has become a bad word in the mainstream left. Follow the scare quotes, “human rights” “anti-racism“…. Left-wing internationalists may protest at this side of Mélenchon’s politics (La chevènementisation de Jean-Luc Mélenchon Philippe Marlière). The main divide appears to be racism. By far the most fundamental emerging issue in this campaign is the conflict between the European Union and national sovereignty. That Counterpunch claiming to be on the left, publishes Johnstone’s defence of the ‘nation’ against the EU is, well, not unexpected. A section of the former French ‘republican’ and anti-EU left has moved from ‘sovereigntism’ to active involvement in the Front National. From the “regulation” heterodox economist Jacques Sapir (a former supporter of the Front de gauche) to Thibaut Garnier (former youth secretary of the Mouvement républicain et citoyen (MRC) and many others, they have found in Marine Le Pen a defender of National Sovereignty (Ces chevènementistes séduits par le FN). This little gang obviously has its admirers in the US. (1) In April 2012, she wrote about the first round of the French Presidential elections a few days earlier and identified Front National leader Marine Le Pen as “notably” “basically on the left” while also labelling Le Pen as “demagogic”. She also rejected claims Le Pen is antisemitic: “There is absolutely nothing attesting to anti-Semitism on the part of Marine Le Pen. She has actually tried to woo the powerful Jewish organisations, and her anti-Islam stance is also a way to woo such groups” Wikipedia. 238,000 votes cast in 2010 equals 15.8% of membership. 130,000 votes cast in 2017 equals 12.2% of membership (And I think I’m right in saying that the ex-UCATT people all got a vote in the General Secretary election as well). 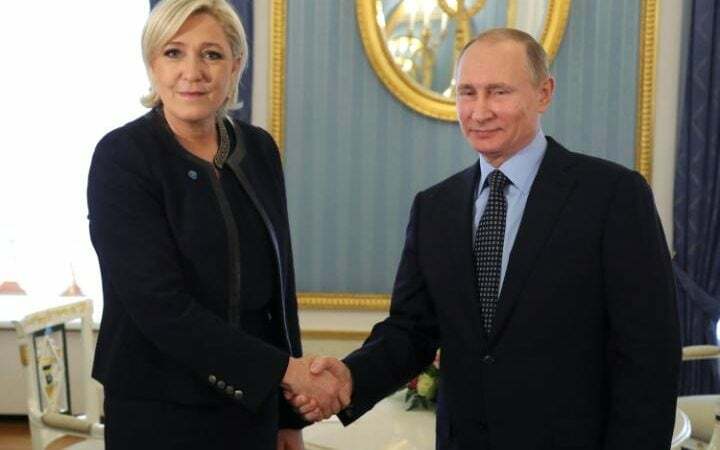 Putin’s de facto support (including financial support) for Le Pen is well known, and all of a piece with his pro-Trump interference in the US election and his backing of the Brexit cause. It has now been plausibly suggested that Le Pen may also be the unwitting recipient of the conscious and deliberate support of ISIS. There’s good reason to believe ISIS was involved in planning, not just inspiring, Thursday’s attack, considering the swiftness with which it claimed responsibility, and the fact that the terror group knew the attacker’s name. But given Le Pen’s strong rhetoric against ISIS and Islam in France, why would the Islamic State plan two attacks in one week, knowing full well that it would benefit Le Pen alone among the candidates? One possibility, as elaborate as it may sound, is that if Islamists want to keep French Muslims from integrating into French society and encourage them to resist through violence, it would be in their best interest to have Le Pen in power. A Le Pen presidency would give the Islamic State the narrative they need to radicalize a very susceptible French Muslim community. As we know, ISIS is incredibly media-savvy. It strains credulity that two attacks were planned for the week before the election with just enough time for the media to really dig into them but not enough time for them to fade from voters’ memories. The timing doesn’t seem like coincidence. It’s hard not to think that the men arrested in Marseilles, or whoever helped them plan, knew full well the result a terror attack could produce in Sunday’s elections. When police prevented the well-planned plot, the terror cell, with or without direction from ISIS, went to Plan B—a man with a machine gun on the Champs-Élysées. Regardless of how Thursday’s attack came to pass, it will almost certainly help Le Pen in Sunday’s election. But it will hurt future prospects of quelling the tensions between France and its Muslim community, or of stifling Islamist influence in those communities—something that was never going to be easy in the first place. M.G. Oprea is editor of the foreign policy newsletter INBOUND. She holds a PhD in French linguistics from the University of Texas at Austin. You can follow her on Twitter here.